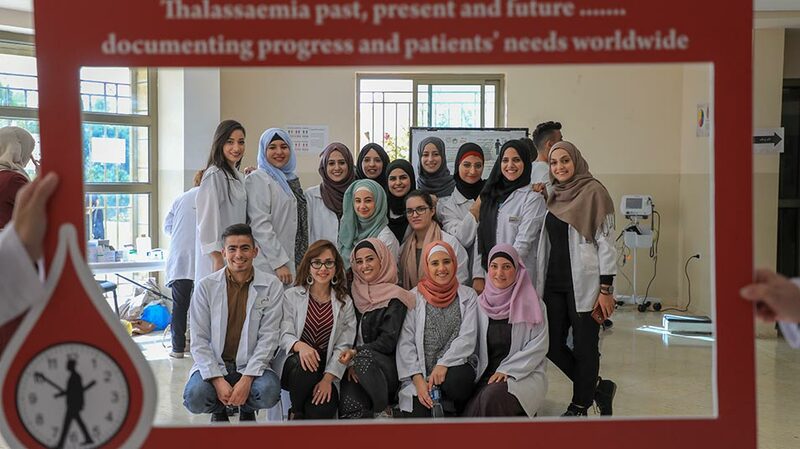 Birzeit University students donated blood on Wednesday, November 28, 2018, for patients in need as part of the “Blood Donation Campaign for the Palestinian Blood Bank,” organized by the Faculty of Pharmacy, Nursing and Health Professions at Birzeit University, together with the Thalassemia Patients' Friends Society, the Palestinian Blood Bank, and the Health Work Committees. The campaign, devised under the Community Health course offered in the Nursing Program at the university, included booths that disseminated information on thalassemia and stations where students can get tested for thalassemia and blood hemoglobin levels, and donate blood for the national blood bank. Khalid Yaseen, an instructor in the Department of Nursing at Birzeit University who coordinated the activity along with Imad Asmar - a fellow instructor in the department - said the campaign helps integrate nursing students into the community and meet the medical needs of the Palestinian population, as well as raise awareness on thalassemia and other blood disorders in Palestine. Yaseen added that this campaign is aligned with the Faculty of Pharmacy, Nursing and Health Professions’ message, which is to meet the medical needs of the Palestinian community and raise awareness on diseases. 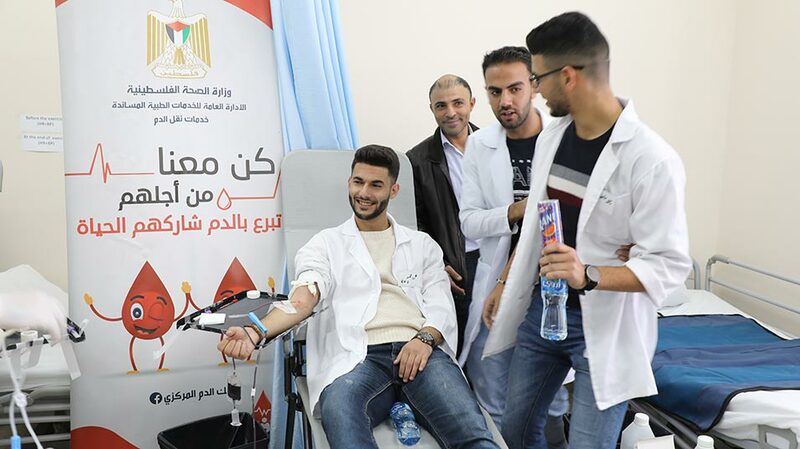 Kholoud Jarar’ia, the Palestinian Blood Bank’s university coordinator, noted the high levels of enthusiasm the students exhibit toward donating blood for patients in need, saying that it was a marked increase from previous years. Jarar’ia also explained the process by which students donate blood at the mobile stations they’ve set up for the campaign. “Students fill out medical forms through which we decide if they are eligible to donate blood,” Jarar’ia remarked, noting that people who donate blood should be healthy, weight 55 kilograms or more, and be free of any medications on the day of the blood donation. Each blood unit, commented Jarar’ia, helps save the lives of three patients, as the blood in each unit is separated into three components: platelets, red blood cells, and plasma. Not only does blood donation help save patients, but it also helps the donor’s body stay healthy as it regenerates the lost blood cells. 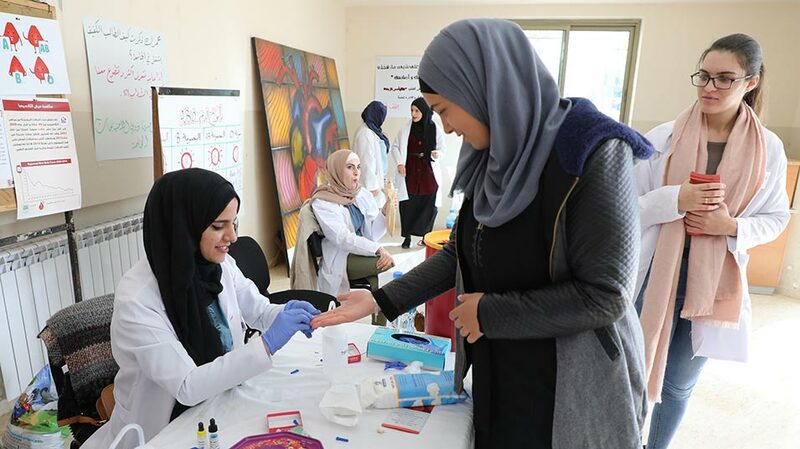 Raya Jaradat, a nurse working with the Health Work Committees, said such campaigns and initiatives as the one held at Birzeit University is part of the organization’s strategy to raise awareness on health and well-being in the Palestinian community. As part of the campaign, the Health Work Committees staff provide blood tests for students, such as the complete blood count test, which shows the number each blood cell type and the hemoglobin concentration, in addition to the thalassemia test, Jaradat remarked. Ihab Marad’iya, coordinator of the youth council at the Thalassemia Patients' Friends Society, along with Walaa’ Shamasneh and Alaa’ Shukri - project coordinators at the society - gave information for the students on thalassemia, noting that the risks for the disease increase exponentially when two carriers marry, which is why a test for thalassemia is required before marriage in Palestine. Shamasneh, who gave a lecture for students on thalassemia, noted that four percent of Palestinians are carriers for the disease - with little or no health problems - and mentioned that there were no new thalassemia cases in Palestine in 2013, a first for the Arab region. Shukri, adding on what her colleague said, said the Thalassemia Patients' Friends Society was recognized for their efforts in raising awareness on the disease by the Sheikh Sultan bin Khalifa Al Nahyan Humanitarian and Science Foundation, which awarded the society the Best Awareness Project and the Inspiring Patient awards in 2018.